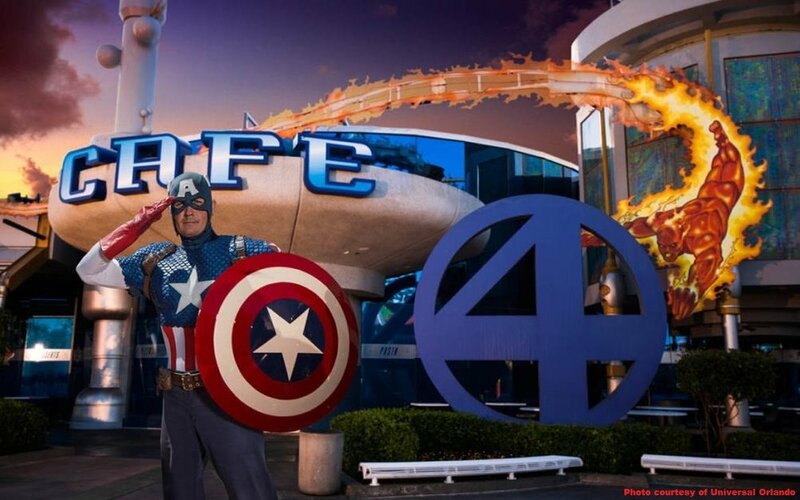 Universal Orlando has introduced a fun new Marvel Super Hero dinner at Cafe 4 in Universal's Islands of Adventure park. Dine with your favorite Marvel Super Heros at the Marvel Character dinner at Cafe 4 in Universal's Islands of Adventure park at Universal Orlando. These Marvel Super Heros will come right up to your table to sign autographs and take photos with your group so start practicing your best super hero pose today! The menu may vary but the buffet will include fresh salads like orzo and mozzarella and tomato along with entrees like roasted rosemary chicken, shrimp scampi, chicken sallopini, Penne Bolognese, stuffed jumbo shells and specialty pizzas. A selection of delicious desserts will able be available. Reservations are required and must be made up to 24 hours prior to arrival. This restaurant is located inside Universal's Islands of Adventure park and separate theme park admission ticket is required. Ask your travel agent to make your reservation or call 407-224-3663.